Any artists that is looking for a private space to create work: dancers, movers, actors, and performance artists. Our space is located on the second floor of Pilgrim Church in Tremont, Ohio. 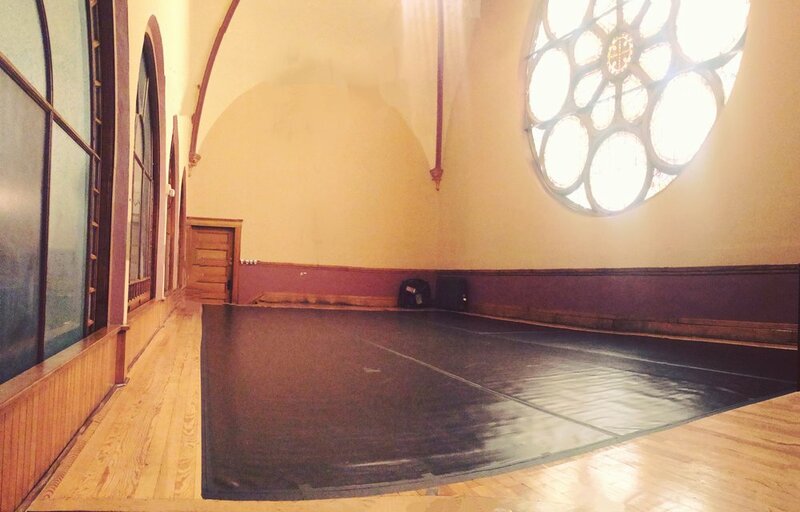 The space is a spacious studio with marley floor and high cathedral ceilings. The studio is well-lit with naturally lighting that comes from the beautiful stain glass windows that surround the room. The space also provides a sound system and aux cord for use during the booking. 1. Email Grace Nicklos at grace@themovementproject.org, please be sure to title the email as "Space Bookings"
2. Please indicate your date(s), designated time slot(s) chosen from above and a short description of what you will be using the space for during your booking. 3. After receiving your confirmation with Grace please print, fill out, and email forms below to Grace prior to booking. Please only socks, bare-feet or dance shoes (no tap or street shoes) in the studio space. Please keep music at a reasonable volume. Signed agreement and forms will need to be fill out, signed, scanned, and emailed before booking the space.